Details: As I have mentioned before, Leyton Westdown Road is a tricky location! 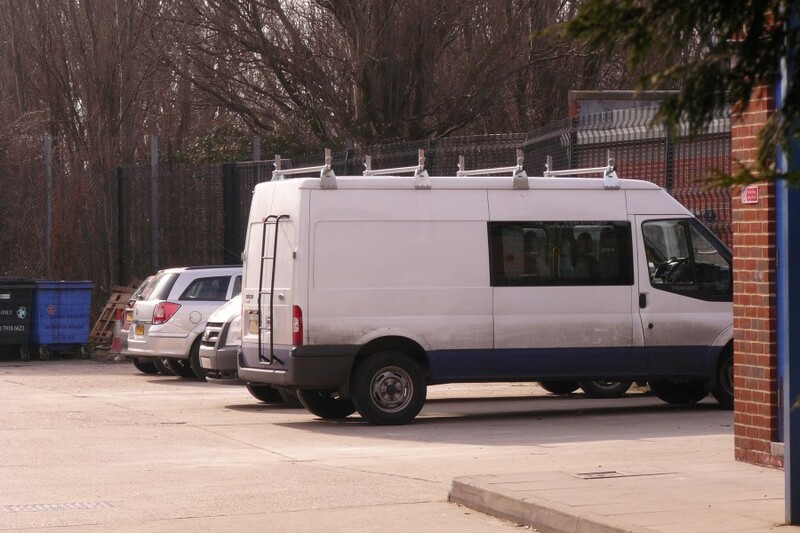 Nearest the camera when we visited on 18th March 2010 was Ford Transit crew van 6773F, delivered in unmarked white/blue in 2009. The man with the new logos has obviously not been here yet! Parked behind is another Ford Transit, registered LS59OAM and with Underground logo on the bonnet. This appears to be a silver minibus. Beyond that is Vauxhall Astra estate LM57AVT. We now know that this is not numbered, but we still can't tell if it carries any livery. Not visible here was another new Transit parked on the opposite side of the yard. All we got on that one was the number 6819F. No reg, no body details, not even sure of the colour!